Stainless Steel Threshold Drains - Linear Trench Drain - Emergency Egress - Jay R. Smith MFG Co.
Jay R. Smith Mfg. 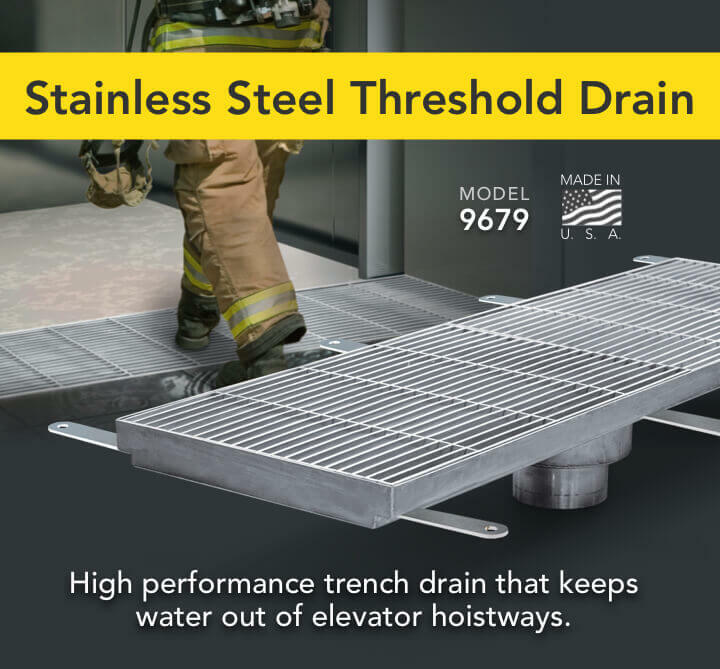 Co.’s threshold drain is a stainless steel linear drain that effectively prevents water from cascading floor to floor during an emergency egress to meet IBC Code 3007. The threshold drain can be used in front of elevators, doorways, stairways and similar applications to receive and drain water with flow rates of 100 GPM. Our Stainless Steel Threshold Drain utilizes 1/4” grate spacing which complies with ADA requirements and helps prevent public falls and injuries. When specified to at least 3’6”, our Stainless Steel Threshold Drain performs at or above 100 gallons per minute.